Tongdosa Temple is one of the Three Jewel Temples of Korea, representing the first Jewel, Buddha. Founded in 646 C.E. by Master Jajang, Tongdosa is not only a temple, but a museum, housing more than 800 designated treasures and cultural assets. Many of Tongdosa’s buildings were destroyed in the Seven Year War and later reconstructed. 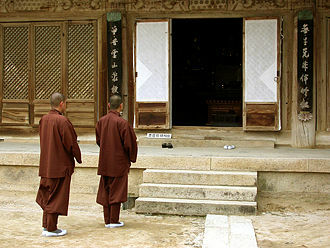 Located at Tongdosa is one of Korea’s Chongnim, or monastic training centers. Tongdosa is sometimes referred to as a relic temple because Buddha’s presence in the temple is represented by the relics of Buddha that Master Jajang brought back from China rather than a large statue of Buddha. 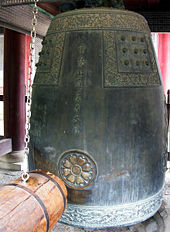 Diamond Precepts Alter, with a bell-shaped stupa believed to contain relics of the Buddha, the main representation of Buddha on the Tongdosa Temple grounds. The temple's name of Tongdo means ‘Pass into Enlightment’ or master Buddha’s teachings in order to bring salvation to humanity. Study and worship at Tongdosa Temple is in the Seon (Zen) tradition. Tongdosa’s location was chosen because the surrounding Youngchwisan Mountains resemble Youngchwi Mountain in India, where Buddha taught the Saddharma Pundarika Sutra. Tongdosa is sometimes called "The Temple without a Buddha" because there is no large statue of Buddha in the main hall or in the exterior of the temple grounds. 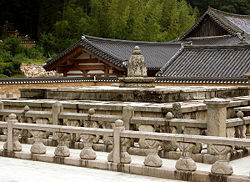 With 65 buildings, it is the largest temple complex in Korea. The many pavilions, pagodas and stone lanterns in a peaceful natural setting remind visitors of the serenity that all Seon monks seek in their devotion. The founder of Tongdosa, Master Jajang, traveled to China in 636 C.E. to study with ten other monks, and on his return to Silla, brought new Buddhist texts, along with relics of the Buddha that he had received from Majusri Bodhisattva, reputedly including a robe Buddha had worn, his begging bowl, a tooth, and a bone from his skull. Master Jajang enshrined the relics at Tongdosa Temple, and they represent Buddha as the center of worship at the temple. The relics are considered more holy than a statue of Buddha, hence Tongdosa has received the honor of representing Buddha among the Three Jewel Temples which have been chosen to represent three elements of Buddhism, bul or Buddha, beop or teaching, represented by Haeinsa Temple, and seung or monks and community, represented by Songgwangsa Temple. Tongdosa was built in 646 C.E., during the reign of Queen Sondok, and it was a major temple throughout the Unified Silla and Goryeo periods, when Buddhism was the state religion, and remained strong even in the Joseon Dynasty. 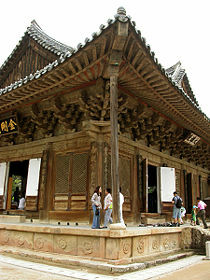 Only one of Tongdosa’s buildings, the Daeungjeon Hall, survived the Seven Year War in the late sixteenth century; the other buildings were rebuilt after that time. Jajang Yulsa or Master Jajang was born into the family of Kim Murim, an aristocrat in the Silla Dynasty. His father worshiped Sambo Buddha and prayed to Cheonbugwaneum Buddha for a son, promising to let his son devote his life to Buddha and become a Buddhist leader. Before Jajang was conceived, his mother had a dream that a star descended to her. He was born on Buddha’s birthday, and named Seonjongryang. His parents died when he was a young man, and he donated all of the family’s land as the site for the new Wonnyeongsa temple. He took the name Jajang when he converted to Buddhism, and he began to follow very rigorous training. The king wanted Jajang to serve as a minister in the court, rather than pursue the life of a monk. When Jajang declined to accept a royal appointment, the king threatened to punish him with death. Jajang replied that he would rather live one day following the laws of Buddha than live for one hundred years breaking them. Hearing this, the king finally relented and allowed Jajang to follow his calling. Jajang built a small hermitage on Yongjussan Mountain, where he stayed while he supervised the construction of Tongdosa Temple. Ceiling painting detail with chrysanthemum pattern, Daeungjeon Hall. In 636 he traveled to Zhongnanshan Mountain, the home of Chinese Buddhism and to Utaishan Mountain, where he received relics of Sakyamuni Buddha, which he brought to Korea in 643, when he was requested to return by Queen Seondeok. On his return, he was promoted to Daeguktong, or ‘Great State Monk’. As the top monk in the country, he directed strong disciple, and sent emissaries to visit all the local temples. He also advocated adherence to Buddhist principles in the government, preaching that Silla is the land of Buddhism. This contributed to Buddhism eventually becoming the state religion. 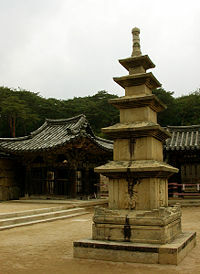 He was directly involved in the construction of a Nine-story Wooden Pagoda at Hwangryongsa Temple (formerly located in Gyeongju), which he saw as a symbol of the unity of the Three Kingdoms, and Tongdosa Temple’s Geumgang Alter, also known as the Diamond Precepts Alter, a symbol of promoting the Buddhist precepts. He enshrined Sakyamuni’s relics in both places, hoping it would help deepen Silla’s connection to Buddhism. As a result, historically Hwangryongsa and Tongdosa were often referred to as ‘brother temples’. There was a large lake at the location where Tongdosa was built, and the area was called Guryongji, or ‘Nine Dragons Pond’. There is a legend that nine dragons were living in the lake, and they did not want to leave. Master Jajang prayed, chanted and wrote Buddhist scriptures to try to induce them to leave, but they refused. Then he wrote the Chinese character for ‘fire’ on a piece of paper, and when he threw it into the air over the lake, and mysteriously the water in the lake began to boil. Three of the dragons flew away to escape the heat and, disoriented, crashed into a nearby cliff. The place where they died is now called Yonghyeolam, or ‘dragon blood rock.’ Five other dragons flew south in to the valley now known as Oryonggok, or ‘five dragon valley’. The last dragon stayed in the lake and became blind. He promised Master Jajang that he would guard the temple, and was allowed to stay. Geumgang Stairs, near which Master Jajang is said to have buried part of Buddha’s relics. Tongdosa’s main hall, Daeungjeon Hall, has an alter, but no Buddha images. There is a window in the hall overlooking the stupas where Buddha’s relics are enshrined. The ceiling is covered with a striking chrysanthemum pattern. Rebuilt in 1601 during the reign of King Sonjo. National Treasure #144. Diamond Precepts Alter, which can be seen out the window of the Main Hall. Holds a bell-shaped stupa or pagoda with a stone fence around it, which is decorated with dragons, clouds and two protector guardians carved in granite. There are four more protective deities at the corners. The stupa is believed to contain relics of the Buddha, and is the main representation of Buddha on the Tongdosa Temple grounds. Guryongji (Nine Dragons Pond) behind Daeungjeon Hall, between Yaksojeon and Josajeon. Yonghyeolam (Dragon’s Blood Rock), about 100 meters north of Mupung-gyo at the temple’s entrance. Youngsanjeon Hall, South Gyeongsan Province’s Tangible Cultural Property #203, which includes a mural depicting a scene from the lotus sutra, which dates from the late eighteenth century. Three-story Stone Pagoda (provincial property #18), constructed with a base and pedestal with carved designs in the base, from the late Silla period. Bowing Stone, a rectangular carved stone with a lotus flower pattern, made in 1085. The original is in the Tongdosa Museum and the one currently in use is a replica. Purimun (Gate of Non-Duality) As in most Korean temples, the final gate leading into Tongdosa symbolizes the non-duality and equality of all things in the universe. The gate was first built during the reign of King Chungryol of the Goryeo Dynasty, and has been rebuilt several times, most recently in the late Joseon Dynasty. Designated Provincial Property #252. 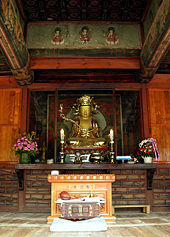 Yonghwajeon, the Hall of the Maitreya, first built in the Goryeo Dynasty at the time of King Gongmin, and rebuilt during the reign of Yongjo of Joseon, contains a statue of the Maitreya (future) Buddha. The inside of the hall is decorated with dragons. Designated Provincial Property #204. 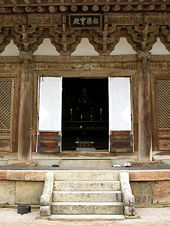 Shrine to Master Jajang, the temple’s founder, which was built in 1727. The ‘windless’ bridge. Like many temples, visitors cross a bridge before entering the temple. This provides a symbolic purification before passing from the secular world to the sacred temple grounds. Tongdosa is a Chongnim, which means a temple that includes a Seonwon (Zen Hall), a Buddhist School and a Yulwon (Disciplinary Hall). This provides all the necessary elements for full monastic training. There are currently five Chongnim in Korea, and Tongdosa became one of the five in 1972. The others are at Haeinsa Temple, Songgwangsa Temple, Sudeoksa Temple, and Baekyangsa Temple. The head of a Chongnim is called a Bangjang or Seon Master. After basic monastic training in one of Korean temples, monks who would like to become priests join a Chongnin and complete four years of further study. In the Seonwon (Zen) Hall, Buddhists chant and practice meditations. Seonwon have been the main place for training Buddhist priests since the late Silla Dynasty. Seon meditation began during Buddha’s life, when the priests were prevented from traveling from place to place during the monsoon season. Instead, they secluded themselves, in order not to hurt the insects, plants and trees while trying to move about during the heavy rain. For three months from April 15 until July 15, they practiced Seon meditation and studied Buddhist precepts. In Korea an additional period of three months of Seon practice has been added, from October 15 until January 15, by the lunar calendar. Seon meditation requires concentrating on a thought or question to find a place of clarity and serenity. The mind is clear of all other thoughts, of good and evil, right or wrong, opening up the way for clear principals to come in. Yulwon Hall (disciplinary hall) is where monks learn discipline and procedural rules of Yuljang, under the guidance of the Yulsa, through lectures and practices of self-denial. Yulwon Halls have been part of the training regimen for Buddhist priests since the Silla Dynasty. Major subjects taught at Yulwon Hall include Samiyuluiyoro, Beommanggyeong, and Sabunyul. 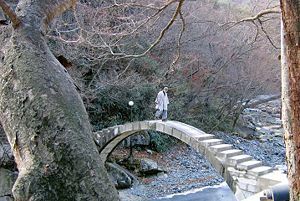 Monk crossing a bridge at Tongdosa Temple. Many temples, including Tongdosa, have Buddhist schools. In addition to teaching Buddhism and the sacred scriptures, these schools offer a full curriculum, including mathematics, science of religions, computer science, English and other subjects required in order to live among society and teach Buddhism to ordinary people. In earlier times, these studies were carried out in the main temple halls, but now, separate facilities have been built on the temple grounds to house the Buddhist schools. There are four stages of study—the Sami Course, Salip Course, Sagyo Course and Daegyo Course—ranging from beginning to advance levels, and requiring four years to complete. In recent times, Graduate School courses have also been added. The teacher in charge of the lecture halls is called a Gangju, and the professors are called Gangsa. Temple stay programs are for visitors, to give them a taste of what a monk or nun will experience living in a temple. Waking up to the morning bell, visitors practice meditation and other ceremonies introducing Korea’s traditional Buddhist culture. Detail of pillars in Tongdosa Gate. 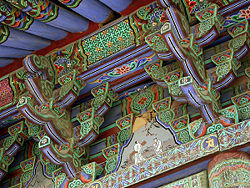 Details of eaves painting, Tongdosa Gate. Detail, top of gate, Tongdosa Temple. Gate eave detail with dragons, Tongdosa Temple. Temple gate guardian. Tongdosa Temple. Stone lantern detail. Tongdosa Temple. Samcheungseoktap (three-story stone pagoda) to the north of Manseru hall, Tongdosa Temple.